At midnight on February 2, Grand Central Terminal, one of New York’s most beloved landmarks and one of the most splendid transit hubs in the world, will mark its 100th birthday, and the Big Apple is throwing a big party in its honor. A year full of commemorative events kicks off today, with a “Grand Centennial” celebration that includes 1913 pricing at many of the terminal's restaurants and stores (10¢ shoe shine! 5¢ coffee! ), giveaways of all sorts of goodies, including centennial luggage tags and vintage train whistles, musical performances, and appearances from notable New Yorkers such as Caroline Kennedy and the Vanderbilts, the family who originally built and owned the world's largest train station. Highlights from the yearlong event calendar include a historic train parade, art exhibits, and book launches. And although 750,000 commuters a day whiz through the building (that's four times as many passengers that come through JFK Airport, by the way), Grand Central Terminal is a memorable spot to stop and linger for a while. Here’s what not to miss. First of all, don't even think about calling it Grand Central Station. Yes, this grande dame is a train yard, but it’s also the terminus of every line that arrives, so the accurate title is Grand Central Terminal. 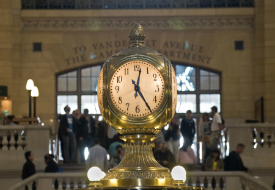 One of the most iconic timepieces in the world is the grandiose, four-faced Grand Central Clock above the information booth on the main concourse area, which is valued at between $10 and $20 million. While the clock has made many appearances in movies, including The Godfather and Men in Black, and the phrase “meet me under the clock” is commonplace among New Yorkers, a lesser-known fact about is that underneath the clock is a hidden staircase to an information booth on the lower level. The oak-leaves-and-acorn motif found in the décor reflects symbols of the all-powerful Vanderbilt family, who financed the construction of the building. Another nod to the Vanderbilts: Every light bulb in the terminal is bare, a subtle reminder that the terminal and railroad they backed is run off electric power (up until then, trains had been powered by steam). Want to discover more of the fascinating history and hidden secrets of Grand Central? Check out these excellent guided tours, or, for a DIY option, there’s also an app available. For more trip-planning information, see our New York destination guide.